Beautiful Luxury Comforter Sets for Your Bedroom! Fancy Bedding: Beautiful Luxury Comforter Sets for Your Bedroom! Are you looking for the best (and most gorgeous) high-end luxury comforter sets for sale? Rich, elegant, fancy and beautiful luxury comforter sets have the power to make any bedroom look like a presidential suite in a fancy hotel! *This one in the picture, for example, is a stunning 10-piece comforter set by Jennifer Taylor! It has the most gorgeous floral embroidery on velvet! It looks like it belongs in a king and queen’s bedroom! I selected the best of the best most luxurious comforters and bedding sets being sold online! They are made from the richest fabrics possible in the most beautiful and rich colors ever! If you have always dreamed of having a fancy bedroom, after a nice sized bed, invest in a fancy comforter set! This is one of the best reviewed 5 stars luxury comforter sets by happy buyers! 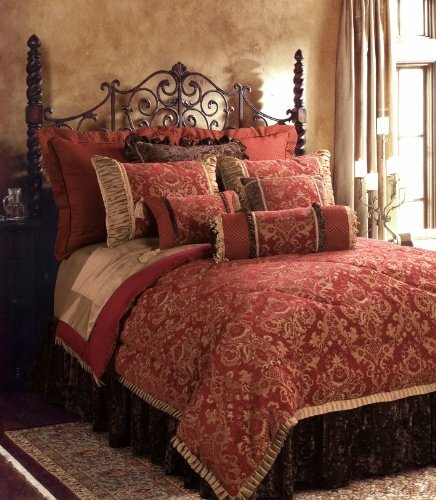 It is a high-quality, rich looking Croscill red, bronze and gold king comforter set! They said they love the ‘rich’ and traditional look it gave to their bedrooms and they also love the elegant colors! It is also very heavy, perfect for cold winter nights! *It comes with the bed skirt and two pillow shams. This is a stunning brick red chenille 9-piece bedding set by Jennifer Taylor! Will transform your bedroom into a luxurious getaway! Beautiful color combination and rich design! It comes with everything you see in the picture, including the bed skirt and all the decor shams! Another gorgeous and extremely fancy bedding set in silver and gray for your bedroom! It is a chenille duvet cover that will ‘Wow’ everyone that enters your fancy bedroom! It also comes with all the gorgeous fancy pillow shams and decor pillows, just like in the picture! Yes, the silver bed skirt is also included! If you want to create a true ‘royalty room’ atmosphere in your own bedroom, then you are going to love this luxurious king size comforter set! The golden colors are very rich and I also love the beautiful golden patterns! 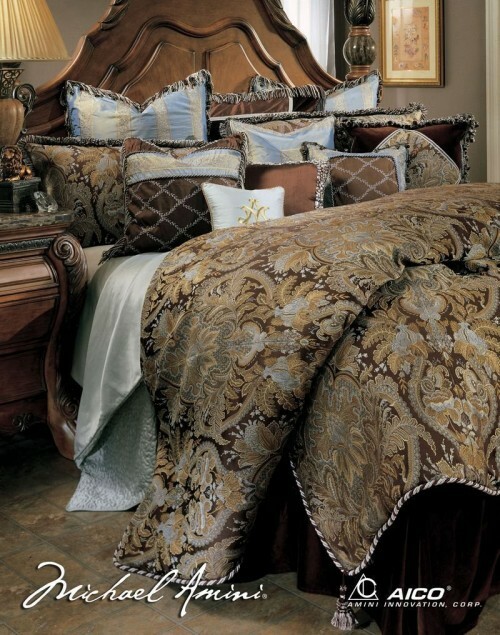 The fancy comforter also reverses to a solid gold tone damask frame. 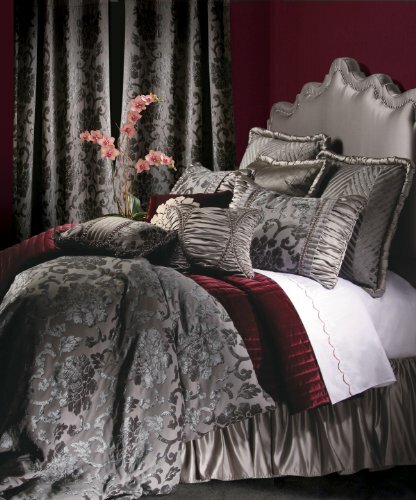 Jacquard comforters are among the most elegant luxury comforter sets created! This is such a lovely chocolate brown jacquard design elegant bedding set! Will make a beautiful gift idea for a newly married couple! The first two things you notice in almost all luxury comforter sets are the distinct rich colors and fancy fabrics! 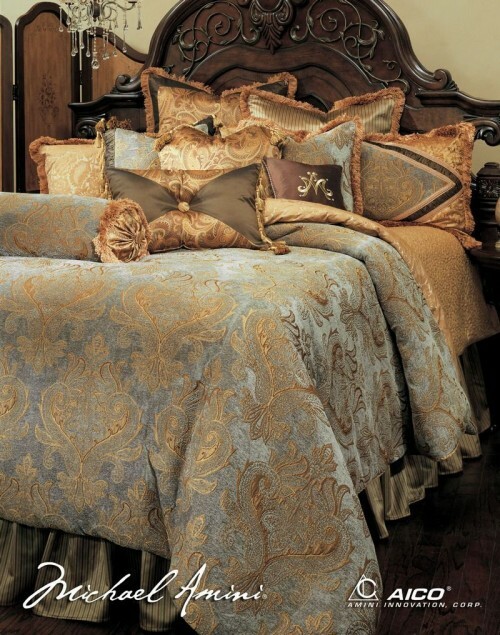 Look at this lovely king size 10-piece jacquard comforter in golden brown and blue colors! I also love the exotic animal print! You will get all the pillow shams and decor shams! What a lovely and unique beautiful sea green and gold color combination! It was what caught my eye first! Another very elegant bedding set for your bedroom! It also comes with the matching bed skirt and all the pillow shams. The Most Beautiful Luxury Girly Floral Comforter Set! This is one of the most beautiful, most elegant, most feminine luxury floral comforters I have ever set my eyes upon! 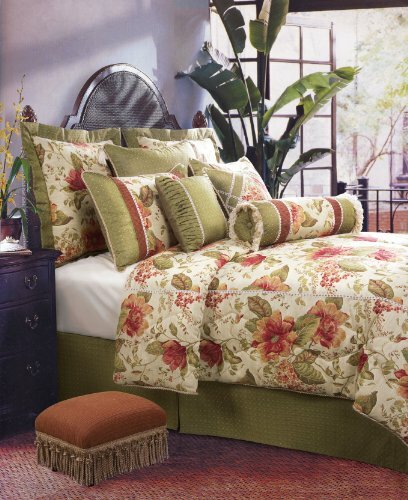 I love everything about this elegant comforter, from the beautiful flower prints to all the other gorgeous colors! The bed skirt is also so lovely! Perfect floral comforter for a very special girl or woman in the family! *You can also get a couple of cute floral matching pillows too, since this set does not come with them, only the two pillow shams. 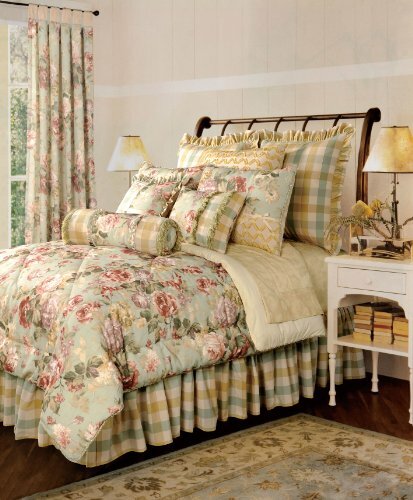 Another rich, elegant and luxurious floral comforter set for sale by Jennifer Taylor! It is a Jacquard 4-piece piece comforter set! Will immediately brighten up your bedroom! Amazing gift idea for any woman! It comes with the bed skirt and two king shams. *You can also get a cute matching Jennifer Taylor Brianza Collection decorative pillow!